Between 1933 and 1945, whether for religious, political or artistic reasons, over 300 painters, sculptors and graphic artists emigrated to Britain. Modern British Art has certainly been all the richer for their contribution to the post-war British art scene, and the Lund Humphries list features monographs on a number of émigré artists, including Josef Herman, Abram Games and Hans Schleger (‘Zero’). Schwitters in Britain, which opens this week at Tate Britain, traces the impact of exile on this major exponent of European Modernism. 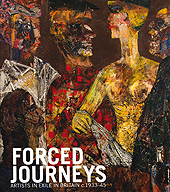 My Book of the Week, Forced Journeys: Artists in Exile in Britain c.1933-45, broadens out the story to encompass 26 artists (including Schwitters) exiled in Britain as a result of Nazi persecution. It recounts their experiences in their German-speaking homelands and Central Europe as Nazism took hold, their flight and their endeavour to regroup in Britain, only to endure suspicion and possible internment as ‘enemy aliens’. It features work created in the internment camps; searching self-portraits; newcomers’ views of war-torn Britain; and attempts to ‘fathom the British temperament’ in the witty and stylish poster designs of Hans Schleger. It is no coincidence that this book was published with Ben Uri, the London Jewish Museum of Art, to accompany an exhibition there in 2009. As the final chapter of this book explains, Ben Uri (founded in 1915 to provide support for Jewish artists working in Britain, often in the face of poverty, anti-Semitism and isolation) has played a significant role in the promotion of exiled and émigré artists. ‘Art, Identity and Migration’ is what Ben Uri is all about. In June we continue the theme of migration and its aesthetic impact with Displaced Visions: Emigré Photographers of the 20th Century, written by Nissan N. Perez and co-published with The Israel Museum, Jerusalem. I suspect that there are many more explorations of émigré and refugee art to be written. Ben Uri also has a blog; this week, read about their new acquisition, George Grosz’s The Lecture.